A happy Friday to all of my readers out there. Things have been rather sporadic on this site because I'm in the process of putting together a new website...very exciting news!!! This original blog of mine was so graciously started by my niece, Abby, back in September 2014, and while I cherish it because it was born of love, the new website will have many more fun things, including a truly functional index. I have to admit I finally stopped with the index because it was such a pain to get it all in order. 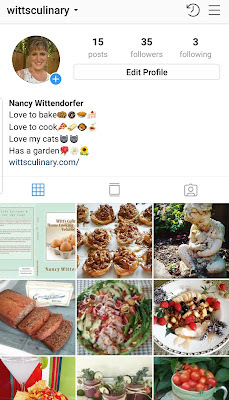 This may not seem like big news to you in the grand scheme of all the food bloggers with their own pages out there, but it is to me. I have to admit this is "not" a full time job for me, my blogging endeavor...it's more like when the mood strikes me. That said, my passion for cooking and baking is a part of my soul. 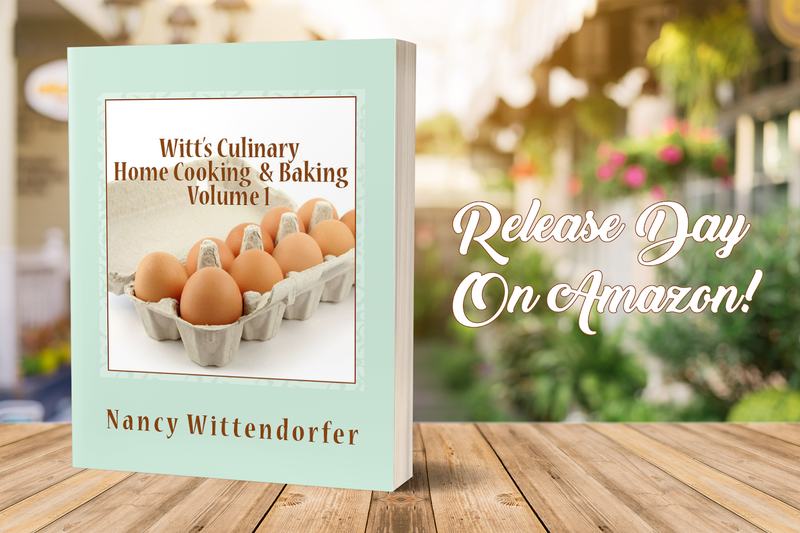 Sharing funny mishaps in the kitchen as well as stories of my growing up, stories of present and mishaps in the kitchen make me feel like you are all sitting around my kitchen table, and will remain unwavering and consistent. Over the years we have seen many changes in food habits and dietary concerns. I remember when my niece surprised me with a visit last year, and said, "Oh by the way, Aunt Nan, I am now vegan." What did that mean I wondered, as there are many types of vegetarian diets. Well for me as a pretty much eat anything and bar nothing person, it was rather daunting, and as I read the vegan description, my eyes continued to get bigger and bigger. No dairy, eggs, products from animals or fish...every time I thought I had found something to put on my grocery list to buy for her impending visit the next day, I had to nix it. But, the bottom line was I love my niece, after all, she was the one who so graciously put this whole blog together for me to begin with. So, I loaded up on fruit of just about every kind, oatmeal, sourdough bread and freshly ground almond butter. Where is this leading, you may ask? Well, I have to be honest. I probably won't any keto recipes, true vegan (I love butter too much) or gluten free recipes, after all, it "is" my blog. Kidding aside, I love food, I love to eat, I'm a sugar addict, I love sweets and just about all foods. 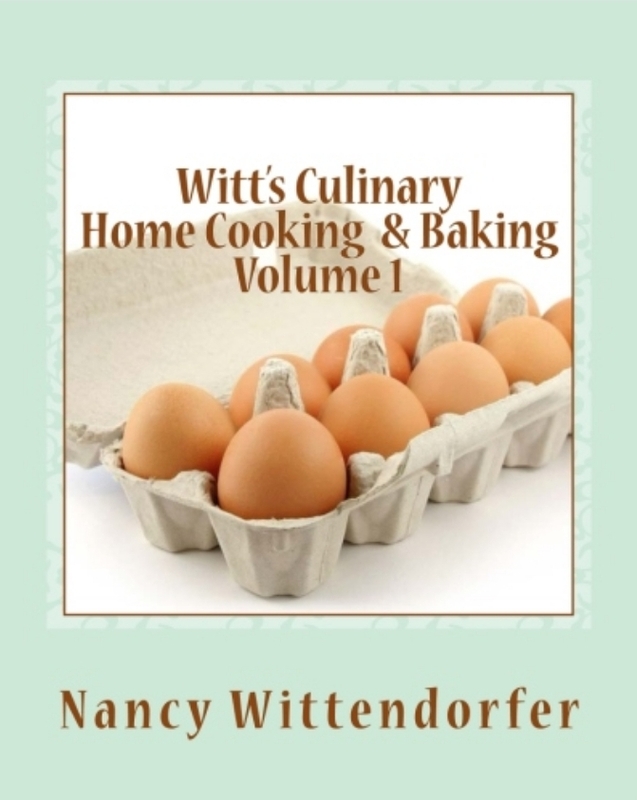 And while my blog, and cookbook (links below for color, black & white and kindle) do have veggie dishes, salads and almost all the recipes do not use processed food, I like to feature recipes which sound good to me as I put my ingredient list together, look pleasing to the eye and taste good. It's not even the end of September, though getting darn close, and twice now I have looked to putting out my Halloween décor. I have always had a rule of thumb that nothing goes out until October 1, yet here I am ready to get a jump on ghosts and goblins, or in my case, my growing number of skeletal family members. Halloween back when I was a kid in the 60's meant going to the local nursery or garden center and picking out a pumpkin, which for me could literally take an hour. Some years I wanted the tallest pumpkin, others I wanted the most round pumpkin, or the pumpkin with the most ridges and lines...it was always something that wasn't the norm. Then the face was another thing altogether. Did I want triangles for the eyes or the nose, did I want more cutout teeth on the bottom or the top of the mouth? Yes, one would think I didn't get my pumpkin done until "after" Halloween, and to this day, I'm just as analytical, and about pretty much everything. What I didn't enjoy about carving pumpkins was actually getting all the goop out of the inside. Invariably, all that stuff would get on my arms and then form a skin over my own skin, and I hated that feeling. I remember scrubbing my arms with a sponge and a little Comet to get the stuff off, and then my arms would be raw. And the one thing my mom never did was roast the seeds in the oven, and I always used to wonder why not, until my late husband requested me to do that for him...and we were talking seeds from 3 35lb pumpkins. Well, after you get all the goop out you have to separate the seeds from the strings of the innards of the pumpkin, then put the seeds in a colander, then rinse them well, then put them in either olive oil or melted butter and then mix with salt (or really the best way is to boil in heavily salted water until the seeds turn gray, then dry them out in a 250 oven) and then roast them in the oven. Now mind you, I did seeds for him from ONE pumpkin, not all three, otherwise I would have been in the kitchen all night. But that said, I can still smell as if it were yesterday, the lusciousness of a fresh cut pumpkin, the seared top when I forgot I had my candle lit inside, even the smell after I blew out the candle and that baked pumpkin smell. Such memories just don't leave one's heart! Halloween and fall invoke caramel apples, or affy tapples as those of us from Chicago know them by. The factory is only 2 miles from my birth home in Niles, Illinois and I do believe they still have tours. Anyway, you would usually find them in the drugstore under a large clear plastic display and of course, I always looked for the one with the most caramel. And you had a choice of plain caramel, or caramel and chopped peanuts. Those were the only options back then and there was none of this covered in chocolate, sprinkles, marshmallows, M & M's, pretzels, etc. I will to this day, take a caramel apple covered in nuts, although now my nut of choice is crushed walnuts. Fall dinners that still warm my heart...pot roast, swiss steak and meatloaf. Nowadays, there seems to be chicken this or vegetarian that simmered in apple cider with a side of couscous. I'm not knocking progress, as we are talking 50 years later, but give me the good old fashioned fall dinners any day. Trick or treating...oh my, how things have changed. From my one nylon costume that made me hotter than blazes, and the mask that was no better, to that set of 3 ties in the back to keep the costume on and would invariably untie. There was always a small rack of costumes in the store or they came as a set in a box. Nowadays, you go to a party store and a 100 foot wall is dedicated to costumes...and I mean about 300 different attires. Makes me sort of long for the simpler days when I had my costume, mask and paper trick or treat bag with a handle. I remember a few years ago going to a haunted house/corn maze with a friend, and the night was very dark and the corn was about 7-8 feet high. It did not disappoint, with gory humans missing limbs, eyes and more poking out of or jumping in my path, which did not bode well with me at all. Once we got outside into the maze, you had the same among the corn stalks. Most of the time I was so afraid of such creatures leaping out at me that I kept pushing myself closer to my friend, thus continuing to push him closer and closer towards the corn fields on his side. Poor thing was trying to be empathetic, but at one point when he was actually IN the corn, enough was enough. But, a few minutes later, there he was back again, lol. 31 years ago today I boarded what would be one of the hardest flights in my life from San Francisco to Chicago, sitting in the smoke-filled section of a DC-10, sobbing all the way there. 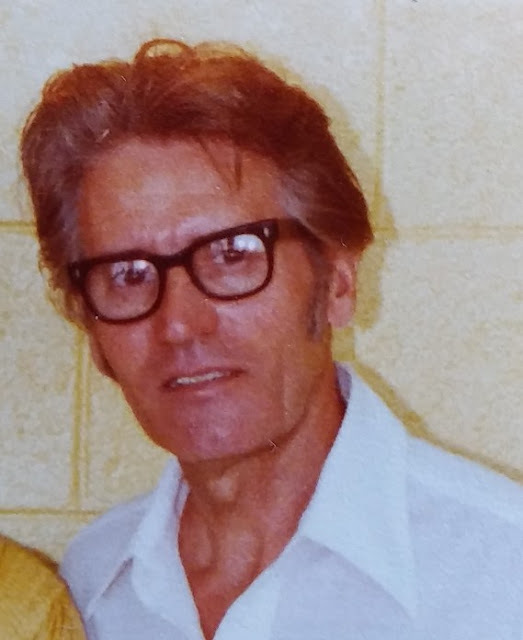 Even now I get choked up thinking about you Dad. I remember the day that your book got put in our local library, the book you wrote for your master's degree back in 1967 while teaching school full-time. I also remember riding my bike more often to the library after that, just so I could look at your book on the shelf. You'd be so proud of me now Dad. I worked so very hard on my own book, which feels like my own little master's degree. And now people are able to buy it, and enjoy my passion of family and food. I was so very proud of your accomplishment and I know you would be so very proud of your daughter's. Gone way too soon, I love you Dad! Fall is in the Air...and in the Sky! Hi to all my readers and hope you're having a good Monday. The weather here in Seattle does "not" know what it wants to do. First, it's sunny, then it's pouring rain...the sky cannot make up its mind! This time of year is somewhat of a mixed bag. Summer draws a line in the sand desperately wanting to stay with us and fall is on summer's heels doing quite a number in trying to push it off the calendar. This summer was also not the norm here in the Emerald City. We had many over 90 degree days, and less rain than we normally do...none for 3 1/2 months to be exact. I think I know what many of you are thinking...that Seattle "always" gets rain. But the fact of the matter is we're in a drought every summer and when 4th of July appears with its deluge of fireworks, everyone seems to hold their breath, hoping and praying that nothing outside catches fire as everything is so ripe for disaster. What did you do this summer? Did you travel anywhere, meet up with family for a reunion, experience anything for the first time? 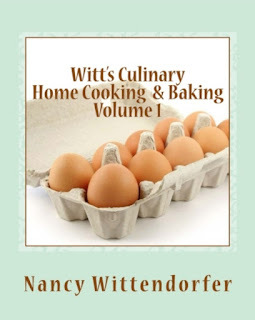 I was working on my new cookbook, Witt's Culinary Home Cooking & Baking Volume 1 for most of it, but I did do one thing that was out of my comfort zone. I own a kayak and last year my goal was to paddle to a buoy that's about 200 feet from shore by my home. I am a good swimmer, but have great respect for the water, whether it's a pool, the lake or the ocean. That said, if I can't see to the bottom, I have a BIG problem. So, last year a friend and I took our kayaks out and we had gone about 50 feet towards the buoy when I happened to looked down, and I couldn't see a darn thing...just murky grey underneath me. Well, it wasn't a pretty sight, and I started having an anxiety attack. My friend told me to just turn around and head back to shore as he kept telling me I would be okay. I was crying and panicked and felt like a failure. Okay, that was last year. Now onto this year. It was a beautiful day about a month ago and I told myself this was the day. My friend came over and we inflated our kayaks. Out we went, and every once in awhile, I just told myself that I could do it. Also, my friend gave me one of his earbuds so I could listen to some of my favorite music to stay distracted. A few times I had to stop and give myself a pep talk, but then I continued to paddle. There was only one time when I really panicked, and that was when I looked at the water when we were almost to the buoy and saw a jellyfish right underneath the surface. I shook my head to pull myself out of any grim thoughts, and ta-da, actually got to the buoy. My friend took pictures and I was crying again, but only because I had done it, I had really gone out to the buoy! Needless to say, going back home was a no brainer. I felt exonerated, as if I had this huge weight taken off my shoulders. I had just kept looking at that buoy out my bedroom window for the last year shaking my head, and now I can look at it with pride and a whole different perspective, knowing it can't daunt me anymore. Whisk the lime juice, zest, oil, ginger and salt in a bowl. If taste is too sharp, add another tsp. of oil and whisk again. Get a large bowl of ice water ready. 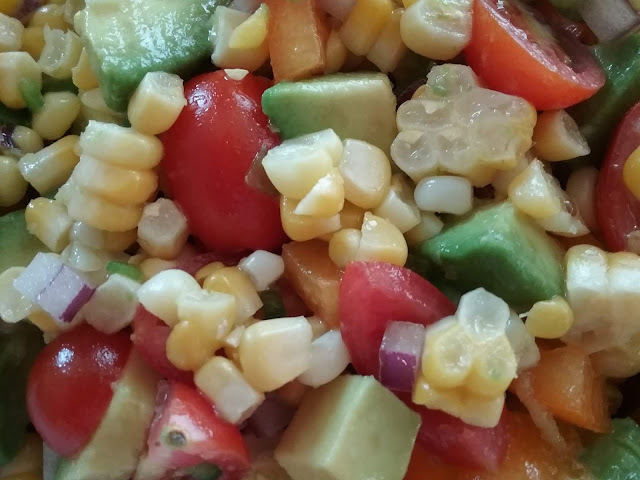 In a large pot of salted boiling water, cook corn for just about 2 minutes, so corn stays tender. Remove from pot and add to the ice water to stop cooking process. 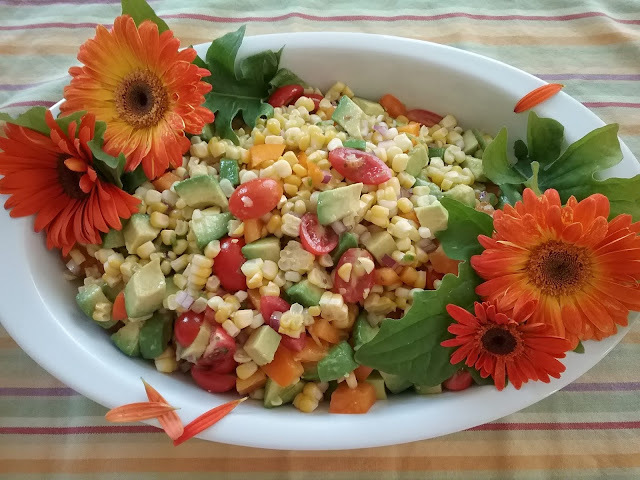 When corn has cooled, place in a large bowl or center of tube pan standing up and cut the kernels off the cob. 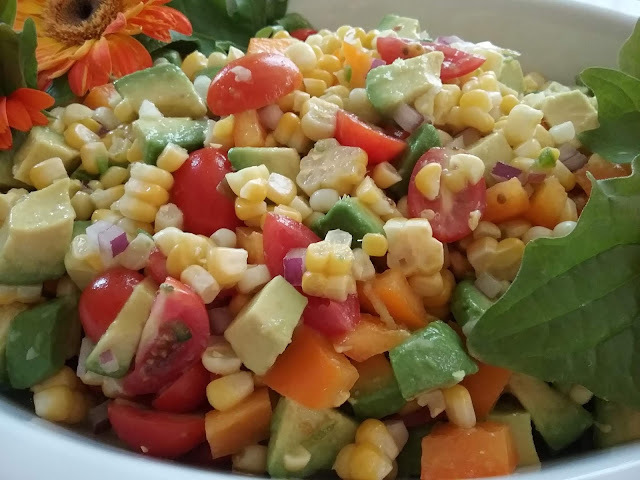 Add corn to a large bowl along with the avocados, tomatoes, pepper and green onions. Pour vinaigrette over salad and stir until combined. Bon appetit! 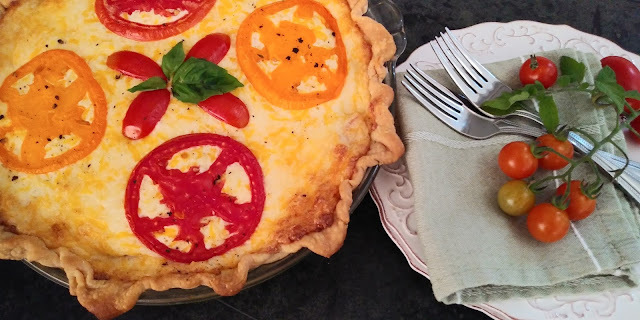 *I didn't peel my tomatoes and wish I had because after baking, I noticed skins peeking out from the pie. 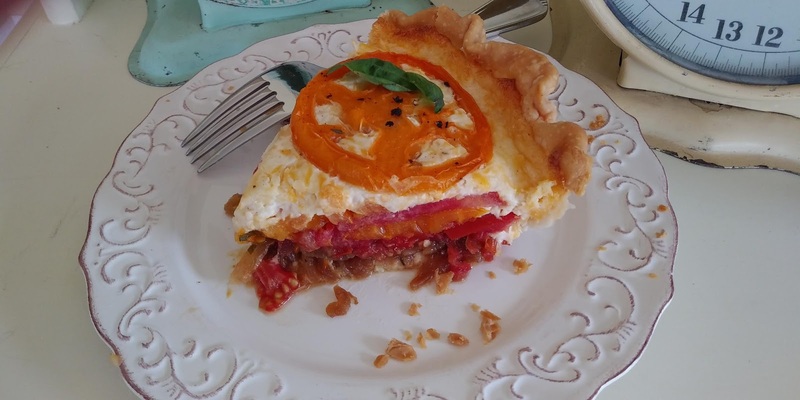 No tomato pie that I have ever found suggests this, but next time, it's a given. 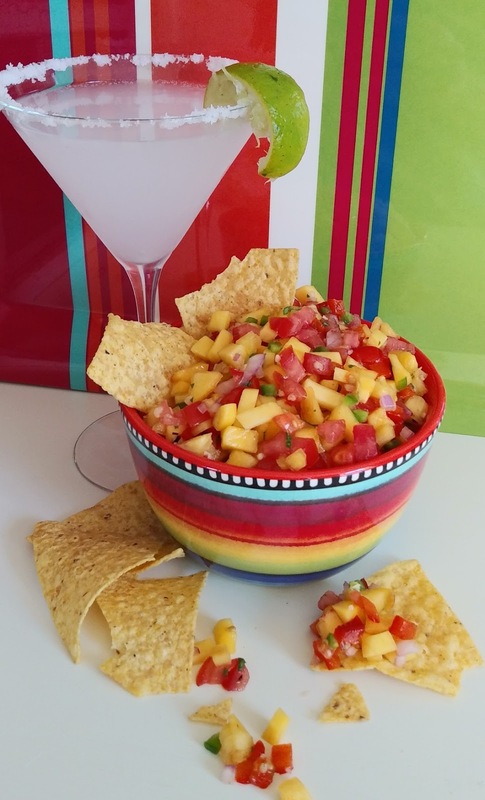 **I used 1 1/2 cups Mexican 4 cheese and 1/2 cup grated fresh parmesan for my two cups. You can certainly use gruyere, cheddar, mozzarella, etc. If you're using a store-bought pie crust, follow the direction on the package for pre-baking, usually 10-12 minutes in a 450 oven, or until lightly browned. 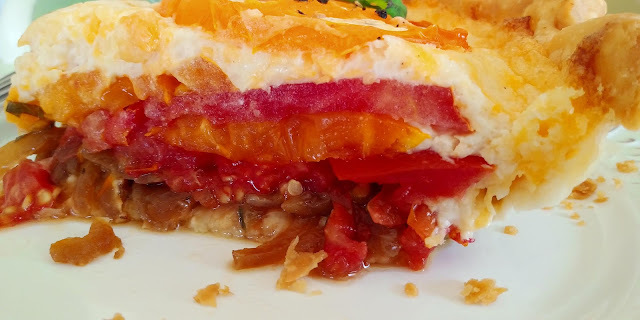 Remove from the oven and set aside while you make your filling. Place the tomatoes in a single layer on a paper towel lined baking sheet. Sprinkle with the 1 tsp. salt and let stand about 15 minutes. 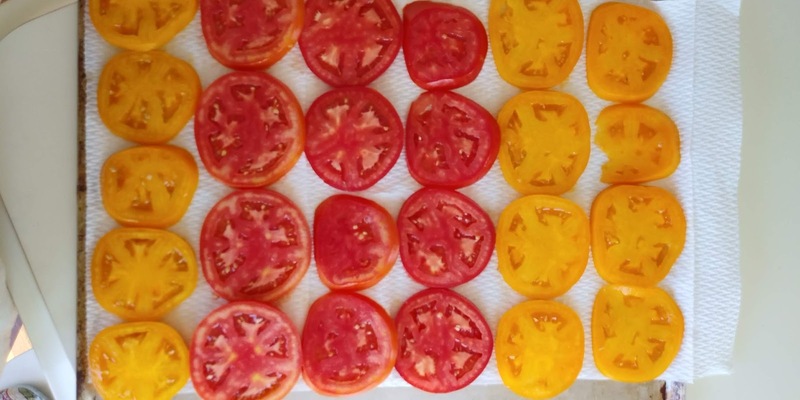 Place tomatoes on clean paper towels and cover with another layer of towels. Press down to get as much liquid out of the tomatoes as you can. Saute the onion in 2 tsp. olive oil with salt, pepper and the thyme, about 3 minutes, or until tender. Set aside a few slices of tomatoes if you want to place on top of pie before baking. It does make for a lovely presentation. Layer the onions, basil and tomatoes in your prepared crust. Stir together the mayonnaise and sour cream and add your cheese(s). Spread over the pie...I use my offset spatula for this. Bake at 350 for 30-45 minutes, or until top starts to brown. Remove from oven and cool for at least 30 minutes before serving. Bon appetit! IT'S RELEASE DAY ON AMAZON!!! THE BIRTH OF A SELF-PUBLISHED BOOK, and how not to throw yourself in the river before it's done. This may not apply to many of you of course, but for me, my book was a labor of patience, perserverance, patience, education, patience and pure unadorned love. Quite frankly, I can't remember any endeavor in my life as challenging...oh wait, there was one. I could never drive a stick shift car. I know, I know, and remember well the day Curt and I went to the Honda dealer to get me a new Civic. The salesman got in the car with us and told me it was virtually impossible to kill the car with the way sticks had improved, and we're talking 30 years ago already. So there I was, in the driver's seat, ready to give it all I had, while Curt was in the front passenger seat bracing for the worst. I killed the car 5 times in the parking lot...yes 5 times. No, we never even got out of the lot. I was tremblihg harder with each go around and there was Curt yelling, "How can you not drive a stick, it's the easiest god - - - - thing in the world"? Well, the way I figured it, if that was one of the ONLY things I couldn't accomplish in my life, I was okay with that. Perhaps in the next volume I'll tell you about my experience with a different stick I was in and the boat! Anyone who thinks they will write and publish a book in order to become rich is CRAZY...yup, you heard it here it first. By the time Amazon takes their cut and the manufacturer takes their cut, you're lucky if you make a couple of bucks a book, and if it's in color, like mine, cut that in half. But I didn't go down this road to become rich, I went down it to share my love of cooking and also my stories of growing up and people I worked with in various jobs. Each recipe that I share has a little memory behind it, some of them fairly comical. Put the stick aside for a moment. Learning shorthand was tough...I wrote beautiful shorthand but couldn't transcribe what I wrote. I actually had one of my bosses sit at my typewriter when I was in my 20's and had him dictate his letters while I typed, my shorthand transcribing was that slow. But the way I figured it, he had a copy of what he dictated in his hands before he even got out of the chair. Learning ticketing at my airline job was tough, but once I got it, you would be hard pressed to find anyone who loved to ticket at the counter more than me. I built 2 houses from the ground up, and let me tell you, the stories I could tell you would leave your mouth agape for several minutes. But, this book...this book was nothing I've have ever experienced in my lifetime. 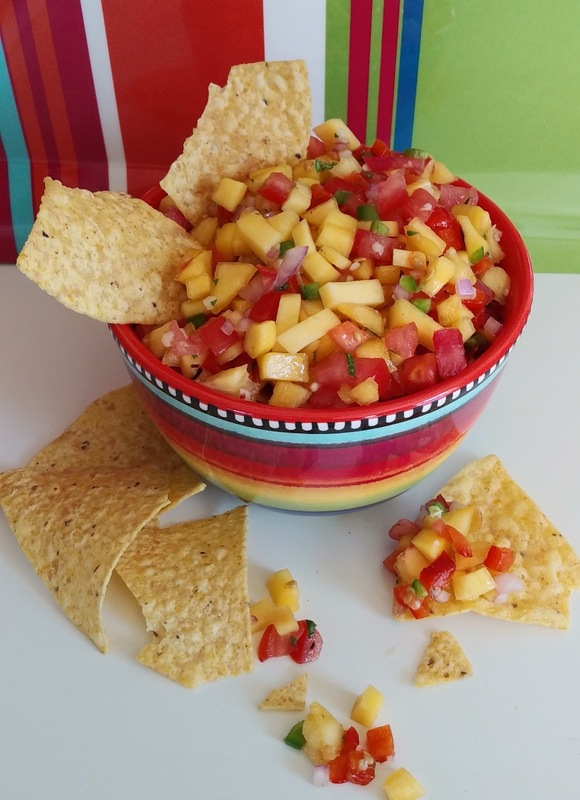 Recipe #124: Nectarine, Mango & Jalapeno Salsa...Oh So Good! Greetings on this Labor Day, and true to form, I have been laboring in the kitchen since late morning. Granted it's a public holiday where festivities are held in honor of the working people. I remember back when I held my job at an airline, most of us who worked that day could only think of one thing...the double time and a half that we would be getting paid for working that day. And more often than not, the airport wasn't that busy, making our wage even all the easier to swallow. Oh my, how do I get off on these tangents of not the subject at hand, which is why my friends say "squirrel" to me so many times while I'm talking because I can go from one subject to another in the blink of any eye. And, if they weren't paying attention, they would be totally lost and think, "she was just talking about that, and how in the world is she now talking about this?" only to have me switch back to what I was talking about in the first place. Enough to make your head spin! In medium bowl, add all ingredients and stir until well combined. Cover and refrigerate at least an hour. Serve with tortilla chips and cold beer or margarita or place on grilled or baked chicken or fish. Bon appetit! * Always remember when dealing with hot peppers of any sort to be careful not to touch face or eyes. Did that once taking my contacts out and paid dearly for it...ouch!